Created to welcome R/V Sally Ride into the research fleet at Scripps Institution of Oceanography, Expedition at Sea: R/V Sally Ride Gallery allows guests experience the sights and sounds of live and work aboard a research vessel at sea. 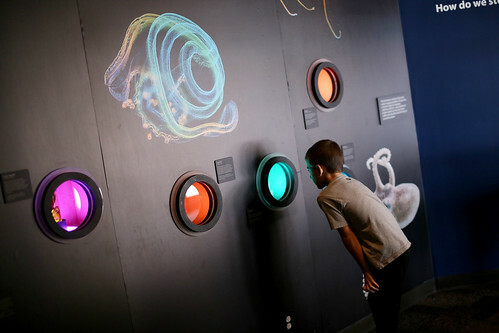 Combining science, art, and technology — along with hands-on learning for young aquarium guests — Expedition at Sea provides a new lens through which visitors of all ages can connect with the global research activities of Scripps Oceanography scientists. Take a virtual tour of R/V Sally Ride; explore seafloor mapping through augmented reality; immerse yourself in a 33-foot-long projected triptych showcasing images from R/V Sally Ride; and discover specimens retrieved from the depths of the ocean during Scripps Oceanography’s 100-plus years of exploration. Young learners can dress like ocean-going scientists, listen to stories from the ship’s crew, touch deep-ocean artifacts; and sort plankton (like the scientists are doing onboard R/V Sally Ride). R/V Sally Ride, which is owned by the U.S. Navy and operated by Scripps Institution of Oceanography, is designed to conduct cutting edge research to help scientists understand and protect the planet. Who is Sally Ride? R/V Sally Ride is named after famed astronaut and UC San Diego professor, Sally Ride. She was the youngest american woman in space and spent her career championing the sciences. R/V Sally Ride continues a Scripps Institution of Oceanography legacy of oceangoing scientific research that goes back more than a century. Looking for even more Sally Ride science? Check out the SIO Games R/V Sally Ride Virtual Reality Tour!